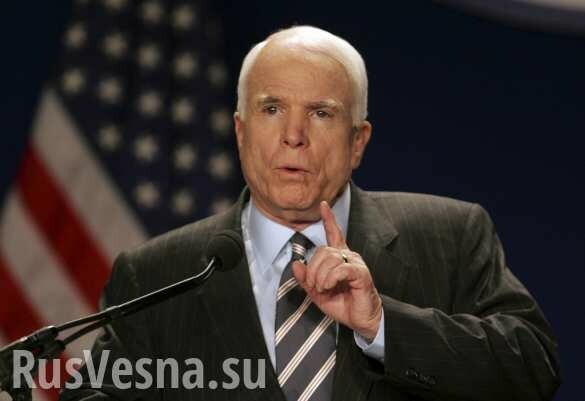 If the militia of Novorossiya capture Mariupol, this will open for Russia a way for an invasion in Moldavia, and afterwards in the Baltic nations, assures American Senator John McCain. As he said in an interview with the Ukrainian newspaper “Day”, as long as Vladimir Putin continues getting away with everything, he will not stop himself. “I am very concerned that if Putin captures Mariupol, he can arrange overland passage and will continue to ex ert pressure on Moldavia and the Baltic countries, seize territory of the Baltic nations, and we have no means of reacting to this. Out of this will come the end of NATO. Our military leaders in NATO already warned about such things. This is very good, but unfortunately President Obama refuses to acknowledge the reality of Russia’s ambitions, Putin’s ambitions,” said McCain. In his opinion, Barack Obama and the European leaders are overly soft in their reaction to Moscow’s actions and only threaten new sanctions. Seeing this, Vladimir Putin is building a new world order and reviving the Russian Empire. According to the US Senator, world politicians do not understand the consequences of this, but they will be very serious. At the same time, John McCain neither noticed nor warned the international community about the fact that an attack on the Baltic Republic out of the Sea of Azov with the same success is possible from Crimea. That would be even closer by a couple tens of meters. Earlier, American political speakers mentioned a “mountain” in Rostov Oblast and access to the sea by way of Belarus. I really hope he doesn’t spend 99.9 percent of his campaign talking sh*t about others and actually spend it by talking about how he’s going to change this country.